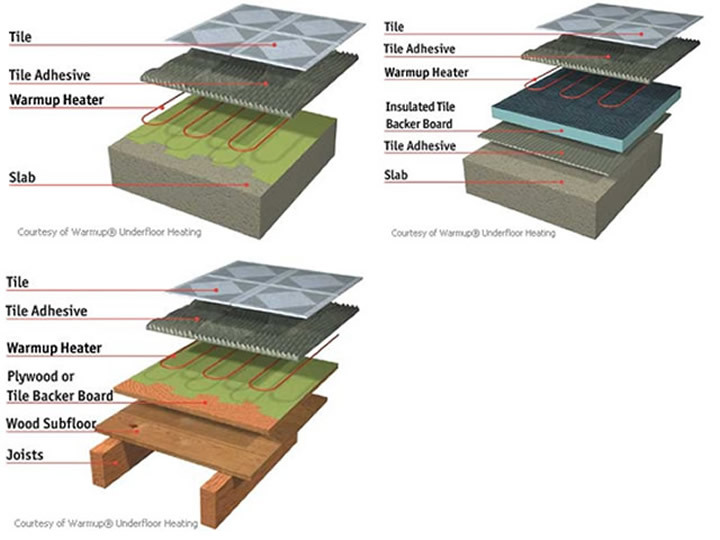 I had been asked to fit under floor heating in the bathroom of a loft conversion that we were carrying out, we used a product called Warmup® UnderFloor Heating. It is available as a Loose Wire System or Heating Mat, because of the bathroom shape I choose the loose wire, as it allowed me to shape it around the toilet etc. It is a great system as you do not have to loop the loose end back, the wire is ultra-thin 2mm dual-core heating element, which hardly raises the floor level (you may need to chisel out channels for the power supply cable). I would think the heating mat would be quicker to lay as you have to stick the wire to the floor with the supplied tape. 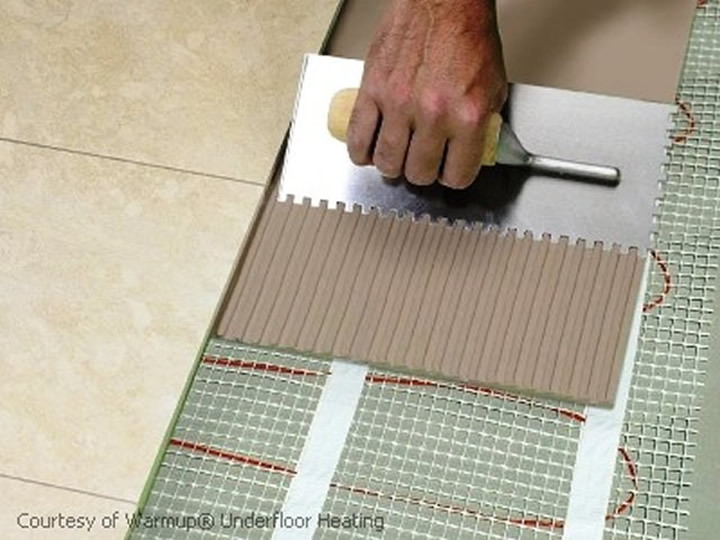 Electric underfloor heating is only suitable for use under any ceramic or natural stone floor tiles, but not under vinyl, wood (incl. laminate), cork or carpet. 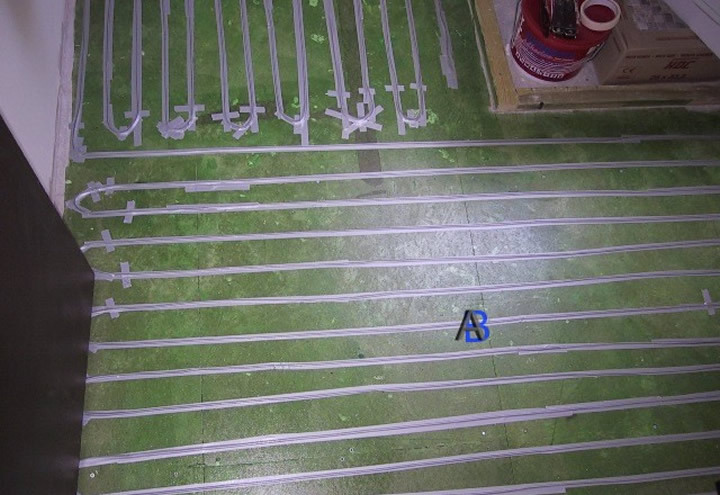 We had laid a suitable sub-floor, as we carried out the loft conversion, because the plan was to use under floor heating, this was primed with the supplied green primer before laying the wire, see pictures below of the recommend sub-floor construction. As you can see in the top picture the cable has been first spaced out (minimum of 50mm and not crossed) and secured with taped, it is then completely covered in tape to protect the wire from the tillers trowel, a thermostatic floor probe is also laid between two runs of the heating element but must not touch the heating element. You will now need a qualified electrician to connect the heater and thermostat timer via a RCD and to test the heater wire before laying the tiles. 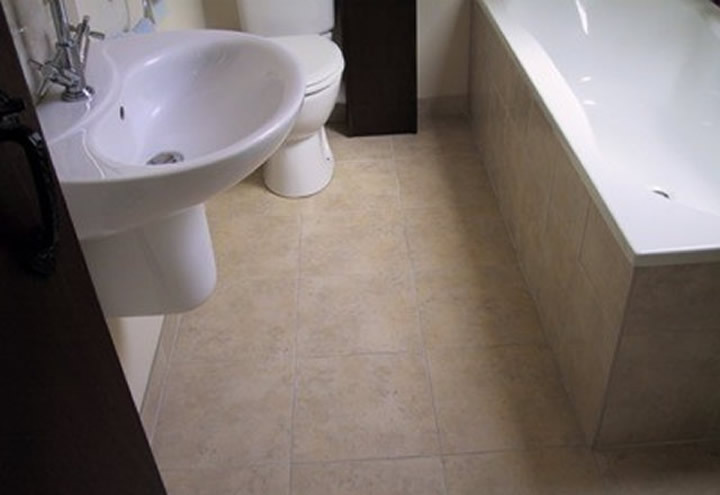 You can now tile as usual taking care not to damage or dislodge the wire with the trowel also use a piece of old carpet or dust sheet to crawl on. The tile adhesive and grout should be of the flexible type,if possible check the heater cable resistance with a multi-meter every half an hour (while laying tiles) to check the cable has not been damaged. Grout as soon as possible and don’t use the heating for at least week. 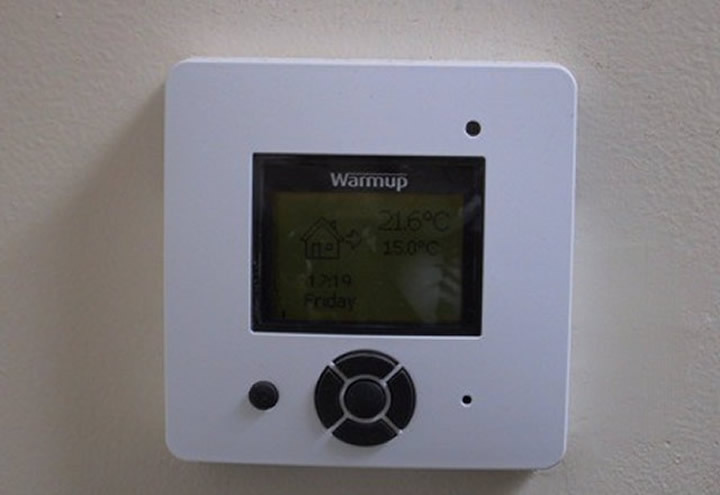 The thermostat timer is similar to a central heating one with settings for when home or away using the thermostatic floor probe or air temperature to adjust the temperature.